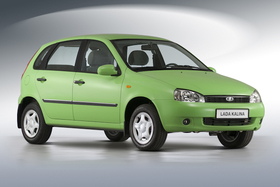 The Lada Kalina's reign as Russia's top-selling car is at risk. Although not generally regarded as part of Europe, Russia and Turkey are crucial "European" markets for many automakers because they include sales from the two markets in their overall results for the region. So Russia and Turkey sales numbers can mean the difference between positive or negative overall European sales. So far, the news is good in Russia, which will provide a big sale boost to brands such as Renault, Nissan, Hyundai, Kia and Volkswagen. In Turkey, however, demand is down following record new-vehicle sales in 2011. The decline is likely to effect Ford, Fiat and Renault most as all three will find it hard to make up any losses in Turkey with sales in western, central and eastern Europe on track to decline for the fifth consecutive year. The Moscow-based AEB industry association forecasts that overall Russia new-car sales will rise 12 percent rise to 2.8 million this year, which is close to the pre-crisis mark of 2.9 million seen in 2008. "The passenger car and light commercial vehicles market in Russia continued to show sustained growth in March though at a lower level than in the first two months of 2012,'' AEB Chairman David Thomas said in a statement. From January to March, Russian sales grew by 19 percent to 614,273, AEB figures show. The Istanbul-based automaker association OSD expects the Turkish market to be flat this year after a record 864,439 passenger cars and light commercial vehicles were sold last year. Turkey's first-quarter sales were down 25 percent to 135,753 units, but the decline is misleading because of a comparison with a stronger-than-normal first three months of 2011. A closer look at the numbers shows that the January-March sales average for Turkey over the last 10 years is 103,300, which means sales in Q1 2012 were 31 percent above average, OSD figures show. "We expect the Turkish market to rebound in the second half, possibly to reach the same level of last year," OSD General Secretary Ercan Tezer told Automotive News Europe. The combination of Renault, Nissan, Infiniti and AvtoVAZ, which is the country's largest domestic automaker, dominates the Russian market. In the first quarter, Renault and its partners increased sales by 2 percent to 193,655, equivalent to a 31.5 percent market share. When combined, sister brands Hyundai and Kia sold 80,484 cars in Russia in the quarter, ranking it second with a 13.1 percent market share, just ahead of Volkswagen Group's market share of 10.7 percent. Sales of VW-, Audi-, Skoda- and Seat-brand vehicles rose 77 percent during the quarter to 65,965. Hyundai's sales in Russia are getting a huge lift -- up 50 percent in the quarter -- because of massive demand for the Solaris. In the first quarter, the South Korean automaker sold 27,072 units of its compact sedan, ranking it third behind the AvtoVAZ's Lada Kalina subcompact (27,820) and the Lada Priora compact (27,433). If Hyundai can keep up the sales pace, it could become the first non-Russia automaker to have the top-selling car in the country since the creation of Lada more than 40 years ago. In the first quarter, sales of the Russia-built Solaris, which is based on the Hyundai Accent, grew 166 percent, compared with an 11 percent decline for the Kalina and a 3 percent drop for the Priora, according to AEB figures. Without a national carmaker, Turkey's annual sales race is usually won by Renault, Fiat or Ford. The first-quarter leader was Renault, which had 19,711 sales, giving it a 14.5 percent share. Fiat followed with 17,208 sales and a 12.7 percent share and Ford was third with just one sale less (17,207) and an identical 12.7 percent share. Turkey's No. 1- and No. 2-selling cars are locally built European subcompacts that feature a trunk rather than the hatchback design favored in Europe. Fiat led the race with 5,797 sales of the Linea in the first quarter. The Linea, which is the sedan version of the Punto hatchback, is built in Bursa, Turkey, as part of Fiat's joint venture with Turk Otomobil Fabrikasi AS (TOFAS). The Renault Symbol, which is a sedan version of the Clio hatchback, ranked second with sales of 5,644 units while the Renault Fluence compact finished the quarter in third place with sales of 5,329 units, OSD figures show.